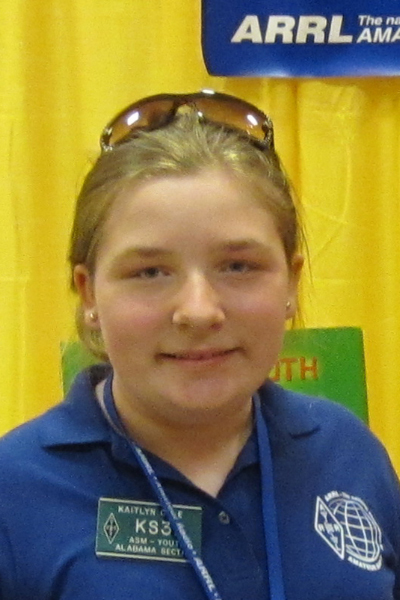 Eleven-year-old Kaitlyn Cole, KS3P, of Harvest, Alabama, has been chosen as Amateur Radio Newsline's 2011 Young Ham of the Year. Among other noteworthy achievements, Cole served as a Net Control Station during two weeks of emergency nets following the southeast tornado outbreak of April 27, 2011. The award presentation is scheduled to be made at the Huntsville Hamfest in August. CQ is a co-sponsor of the YHOTY program, providing winners with a free week at SpaceCamp. Kaitlyn is the 26th Newsline Young Ham of the Year, and the youngest to date. Huge pileups are reported for the ST0R DXpedition to South Sudan, the world's newest independent country. Online DX News site dxcoffee.com reports the group expects to be on the air through August 10 on all bands between 160 and 6 meters, operating mostly in CW, with occasional shifts to SSB and RTTY. The newly-established Republic of South Sudan is the latest addition to ham radio DX lists. It was added to both the ARRL's DXCC list and the CQ Countries list as of July 14, its admission date to the United Nations. Details will be in the September issue of CQ magazine. One ham was killed and three others were injured recently in two widely-separated antenna accidents. Tim Anderson, K0OR, was killed and Tom Embree, NC0K, was seriously injured when a 110-foot tower they were helping to disassemble in Hot Springs, South Dakota, collapsed on them. According to the ARRL Letter and Newsline, all but the bottom 30-foot section had been taken down when the accident occurred on July 16. Both men were on the tower and fellow members of the Hot Springs Amateur Radio Club were beginning to release the guy wires when a gust of wind toppled the tower section. In Texas, two hams taking down an inverted-vee antenna at the Wichita Amateur Radio Society's Field Day site received electric shocks after a strong wind gust blew a guy wire or the antenna's feedline into a power line. The ARRL Letter reports that both Danny Caldwell, AD5IP, and Mike Byrne, AE5CO, were taken to Parkland Hospital in Dallas for treatment and were later released. Club officials said all safety precautions were being observed. A man from Yemen accepted a plea bargain in connection with a high-seas piracy attack this past February that left three US hams and another American dead. According to Newsline, 23-year-old Mounir Ali pled guilty to taking part in the armed hijacking of the yacht Quest off the coast of Oman. Ali had claimed that he and four other Yemenis were hijack victims themselves, but US prosecutors said he willingly joined the pirates in exchange for a share of any ransom money. They also said Ali was not directly involved in the shootings of the four Americans. Sentencing is scheduled for October 21. The landing of Atlantis in mid-July marked the end of the U.S. space shuttle program, but it also marked the end of a nearly-30-year association between ham radio and the shuttle program. The first ham radio operation from space was conducted aboard the shuttle Columbia in 1983 by then-Astronaut Owen Garriott, W5LFL. The ongoing tradition of ham radio contacts between astronauts in orbit and children at schools around the world began on the shuttle as SAREX, the Shuttle Amateur Radio EXperiment, which has since morphed into ARISS, Amateur Radio on the International Space Station. 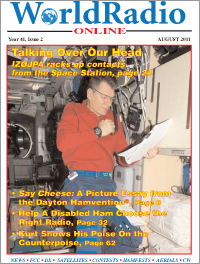 On the topic of ARISS, the ARRL reports that four astronauts and astronaut candidates recently passed their ham radio license exams, and one astronaut upgraded from Technician to General. An on-board test of the ARISSat-1 satellite is tentatively scheduled for July 30-31, with a possible launch from the International Space Station on August 3, according to the AMSAT News Service. The launch is tied to the scheduling of a spacewalk, as the satellite is to be hand-launched by space station crew members during that spacewalk ... currently scheduled for August 3. The launch has already been delayed several times. In July, we reported that the National Oceanic and Atmospheric Administration's Space Weather Prediction Center (SWPC) was planning to end its broadcasts of solar information on WWV and WWVH. It appears that user feedback was significant enough to persuade officials to change their minds. NOAA now says it "plans to continue this service for the foreseeable future," and that content updates are being made "as a result of the feedback process." Amateur radio is prominently (if not accurately) portrayed in two of this summer's major movies, "Mr. Popper's Penguins" and "Super 8." The ARRL Letter reports that two of the main characters in "Mr. Popper's Penguins" communicate using what appears to be ham radio, but use handles instead of callsigns and the 15-meter frequency to which the radio is tuned (21.246 MHz) was not available as a voice frequency to US hams in the years in which the film is supposed to occur. In "Super 8," a ham tells of strange noises on his receiver and sheriff's deputies follow up by decoding the signals and learning vital information. Unfortunately, their "receiver" is a Heathkit Seneca VHF-1, which was actually a transmitter. The Hurricane Watch Net is looking for new members who can "effectively communicate with Central America and the Caribbean, Mexico and South Texas on the 20-meter band," according to the ARRL. The net is also looking for more members who are bilingual, especially those fluent in both Spanish and English. The Hurricane Watch Net operates on 14.325 MHz when tropical storms or hurricanes are within reach of land. More information is available on the net's website at <www.hwn.org>. The ARRL and the National Weather Service have updated and renewed their Memorandum of Understanding (MoU), continuing a formalized relationship that extends back to 1986. Under the agreement, volunteers in the ARRL field organization are encouraged to contact NWS Warning Coordination Meteorologists and work with them to establish and maintain SKYWARN networks in which trained spotters observe and report weather conditions during storms. The ARRL recently hosted a two-day RF interference workshop for utility company employees. Four (yes, four -- ed.) people attended from different parts of the country. The ARRL Letter reports they were treated to a comprehensive mini-course on identifying, tracking and resolving RFI run by Mike Martin, K3RFI, owner of RFI Services, a company that is dedicated exclusively to RFI tracking and training. The Republic of South Sudan is the newest addition to the CQ DX Award Countries List, CQ DX Awards Manager Billy Williams, N4UF, announced today. It is #342. Verifications confirming contacts after July 14, 2011 (the date of its admission to the United Nations) are acceptable for credit. No award credit is available for southern Sudan contacts made during the 1980s and 90s. Verifications may be checked by a CQ Checkpoint or sent to the Award Manager. Include return postage or SASE with updates if you send cards or desire a reply. Updates are accepted only via postal mail. The CQ DX Award Countries List contains 342 entities including Kosova. Endorsement stickers for 340 are not yet available. When stickers are available, an announcement will be posted on the CQ DX web page (see URL above). As of this time, the International Telecommunication Union has not yet issued a callsign prefix block for South Sudan. For purposes of the CQ DX Field Award, most of South Sudan is in field KJ; small northern portions (above 10 degrees north latitude) are in field KK. More information on the CQ DX Field Award is available at <http://www.cq-amateur-radio.com/cq_awards/cq_dx_awards/cq_dx_field_award/cq_dx_field_award.html> and at <http://home.earthlink.net/~bfwillia/gridfield.html#CQ DX FIELD AWARD RULES>. In addition, South Sudan will count as a country (entity) multiplier for the CQ DX Marathon, the CQ World Wide DX Contest and any other CQ contests that use country multipliers. 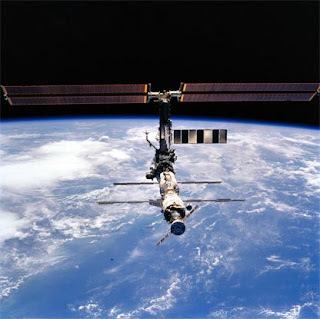 During the International ARISS teleconference July 14, Sergey Samburov, RV3DR, announced that the ARISSat battery will be charged late in July. 1200-1400 UTC on July 31. The standard ARISSat-1/KEDR 2-meter downlink band plan should be transmitted as well as the FM signal - also downlinked on 437.55 MHz. More information as it becomes available.